Hillary Clinton’s sweep of Tuesday’s major primaries in Florida, Illinois, Missouri, Ohio, and North Carolina has unarguably been a major blow to millions of Bernie Sanders supporters and activists across the country. While the results were close in Illinois and Clinton’s apparent victory in Missouri was won by about 1,531 votes (still subject to a recount if Sanders requests it), the losses hit hard following Bernie’s surprise Michigan win on Super Tuesday. He’s right. It was a bad loss for Bernie and it is demoralizing for all of the people energized by his campaign. The fact that headlines across the country spoke of a surprising Clinton sweep of all Tuesday’s primaries were not anti-Bernie (at least not most of them) as much as they were accurate. It’s time to grieve a bit and then get back to organizing. 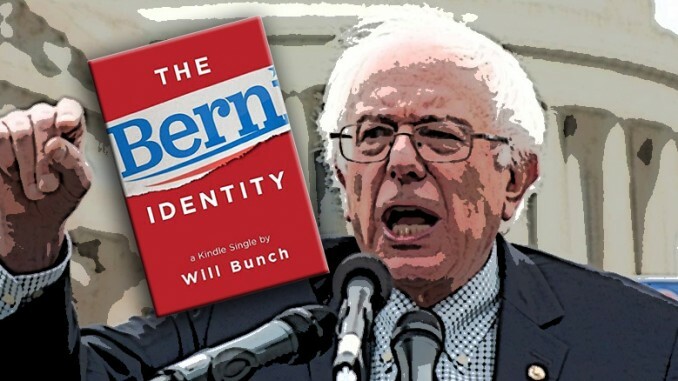 In that spirit, we thought it would be a good time to give a little plug to Will Bunch’s book (Kindle single), The Bern Identity: A Search for Bernie Sanders and the New American Dream. Published this past December, Bunch’s book is a quick read and the kind of overview of Bernie Sanders’s career that reminds all of us why he’s energized a new movement focused on economic and social justice. Seriously, check out this book. Not only is Will Bunch a fantastic writer, his book is a way of stepping out of the intensity of a whirlwind of this year’s presidential campaign and reminding us all why Bernie – democratic socialist, grumpy old white guy – has been the one to spark a movement.